The first benchwork was ready in early 2016 and layout construction started right away. The new layout is a completely different theme from my first layout. Most scenery techniques are new and so is the choice of scenery materials, color compositions etc. The photo above shows the first and almost finished scene which allowed me to test the basic set of scenery techniques and materials. Like my old house the new one was selected with hobby in mind. The direct reason for moving was meeting my wife and getting married and thus the need for a new home for "us" rather than she living in my house. My wife is also a hobby person so we found a property with a secondary building that could house our hobbies as well as my office and storage. After moving in in late 2012 I started working on the track plan. The main room of that building houses both my office and our hobbies. Since the room was to house more than just the layout I had to decide on the size and the main perimeters of the layout and then on the basic shape of the benchwork. Of course based on the requirements from the choice of possible layout themes. All in all a lot of free parameters which made it quite hard to nail down a plan. I know, it's really what we in Danish call a "problem of luxury" but still some decisions had to be made. Long story short I ended up with a layout area of 9.0x5.0m (30'x16'5"), 2 sides along walls and the other two being aisles shared with the other functions of the building. I stated out working on a layout theme similar to my old layout, ATSF in New Mexico, but I ended up deciding for southwestern Pennsylvania. I have for many years been torn between those two themes since I got to stay about a year in Pittsburgh PA on a business assignment. The original idea was to model the W&LE line more or less as a present day operation. I later decided to backdate the layout to the mid 80s when the line saw a little more traffic but also still had CTC. Mainly because the CTC was a rather special type of "Poor Man's CTC" that would be fun to model. Mid 1980s also meant that the formerly Norfolk & Western owned line now was part of the newly formed Norfolk Southern. With the NS also came Southern long-hood-forward diesels and I have a thing for those... The line was originally built in the 1930s as part of the Pittsburgh & West Virginia which later bacame part of the famed Alphabet Route. The prototype was called the "Connellsville District" since it ended in Connellsville PA. It originally connected end-to-end with the Western Maryland but when WM became Chessie and the WM-line was abandoned in favor of the parallel B&O the Connellsville District was instead connected to the Chessie ex. B&O line in Connellsville. On my layout the line ends in an open staging yard called Collennsville Yard where it interchanges with not only the Chessie but also Conrail (ex. PRR). And thus the name "The Collennsville District" was born. Apart from the Monessen/Speers area the line is freelanced from the various locations and features found on the prototype. The east end of the line is the yard of Collennsville. It is really just an open staging yard that can represent a number of different interchanges. It was built as an open staging yard to allow for turns working the yard and therefore it needs to be accessible for some switching. The yard itself is just 6 stub-end tracks but with convenient crossovers added to allow running around an incoming train and to allow doubling long trains. Since Collennsville Yard is "just" a staging yard I was a bit lazy and laid it with Micro Engineeing code 55 tracks, whereas the remainder of the layout is being handlaid (using FastTracks tools) with code 40 rails for better realism. The yard will be scenicked and my original thought was to just do a very rudimentary backdrop and fill the space with ballast and simple ground cover. But Collennsville Yard fills up almost half of the "front" of the layout and for that reason alone should be an area of visual interest to visitors. The challenge is that the yard almost fills its area completely with tracks and there is only about 12mm (½") of room towards the backdrop and only slightly more at the front. So scenery calls for some creativity. Inspired by my late friend Flemming Ørneholm I will pack the yard into a city environment with most inspiration from Pittsburgh PA. 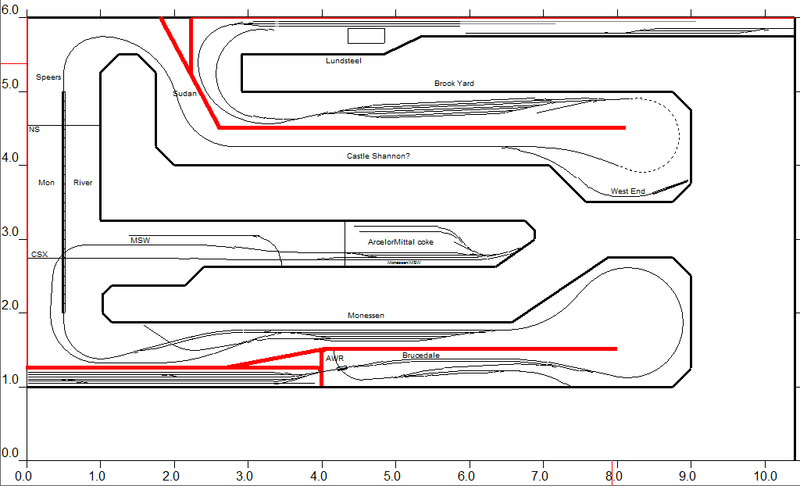 I have later decided to include a commuter train operation with a station at the lower left. This will eventuelly require some crossovers to be changed. The mainline exits the yard towards the right where is dives through the backdrop into the Brucedale scene. The name Brucedale comes from the prototype locations of Bruceton and Owensdale. Both are interchanges to local shortlines; The Allegheny Valley Railroad and the SouthWestern Pennsylvania. On the Collennsville District Brucedale is a siding from which a connector track runs down into the valley to the Allegheny Western RR. The interchange itself is on the former Brucedale Industrial RR which was bought out by the AWRR. Only the line connecting to the rest of the AWRR remains and the former BIRR is abandoned west of Brucedale. The branch and the connecting track to the Collennsville District were rebuilt "some years ago" in anticipation of new traffic that didn't really materialize. Brucedale is situated in a valley along Trout Creek. Along the creek runs Pennsylvania Highway 980. The town itself offers a few businesses including a Denny's restaurant and a general store. The former engine house of the Brucedale Industrial RR has been sold off to a local trucking company. Brucedale is the layout's current end of track and scenery. From Brucedale the highway will follow the railroad a short distance before the railroad enters a dense forest and tunnels through a ridge, eventually reaching the farmlands near Monessen. Monessen Yard is the interchange point with the Monessen SouthWestern RR which is the Wheeling-Pittsburgh Steel Corp. plant railroad, serving the mill located along the Monongahela River. The yard will be a compressed version of the real yard in the 80s. From Monessen yard and siding the Collennsville District will continue in a cut and via a sharp (hidden) curve reach the layout's signature scene: The Speers Bridge. 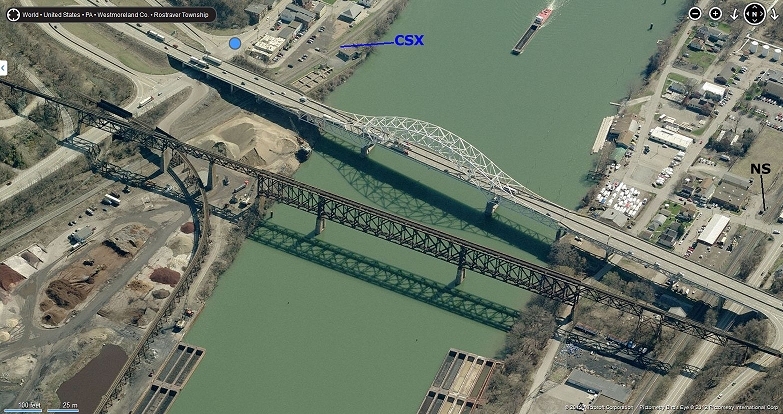 The layout's signature scene will be the impressive bridge crossing the Monongahela River from Belle Vernon to Speers. The bridge will be some 300cm (10') long. 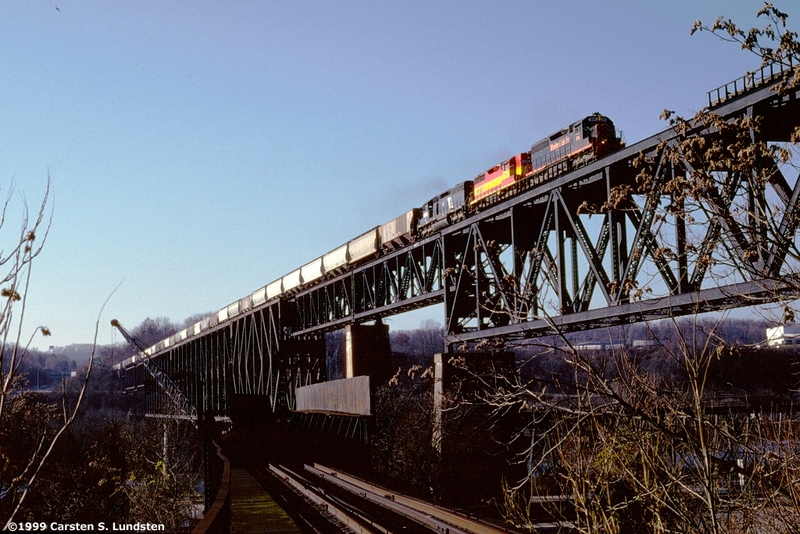 The MSW drops from Monessen Yard on a rather steep grade and crosses under the east end of the Speers Bridge to continue along the river to Wheeling-Pittsburgh Steel's mill. So far benchwork has only been built far enough to include the Speers Bridge scene. The Monessen Southwestern is the plant railroad of Wheeling-Pittsburgh Steel and runs from the mill along the Ohio River to the interchange with the Collennsville District at Monessen Yard.